This series of 13 custom Honda CB1000Rs were built by official Honda dealers across the Iberian Peninsula, including Spain, Portugal, and the Balearic Islands. 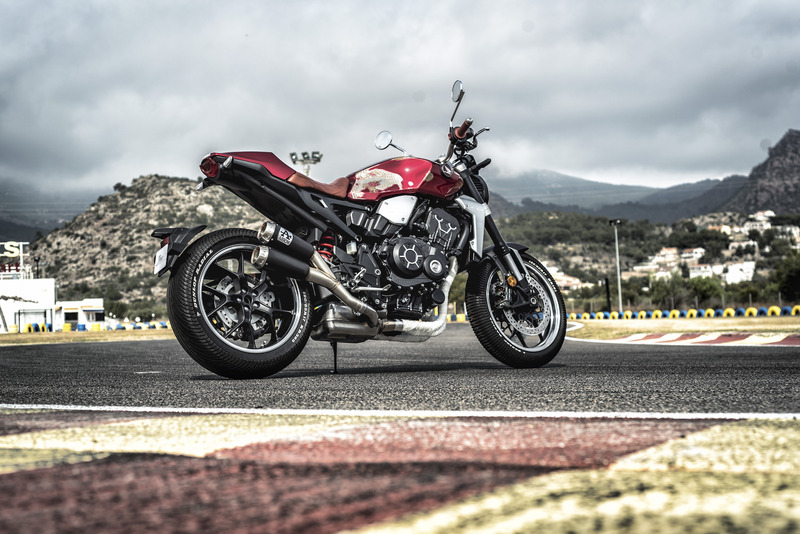 Each dealer was given a new 2019 Honda CB1000R, with a budget of 3,000 Euros for parts, and an additional 2,000 Euros for paint. 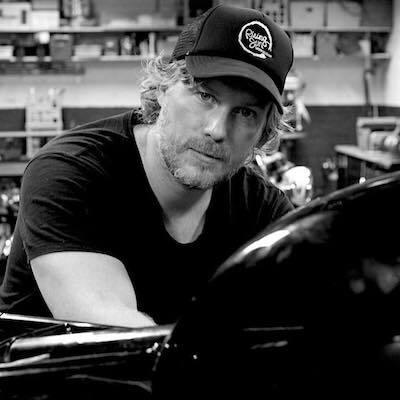 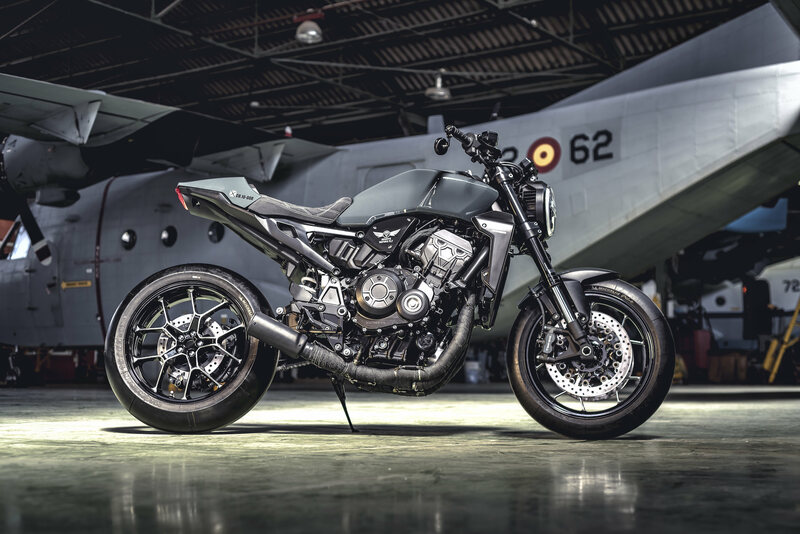 Voting for the winner is now underway, the semi-finalists will be chosen on the 18th of March and the final winner will be selected on the 7th of April at the Vive la Moto Salon in Barcelona. 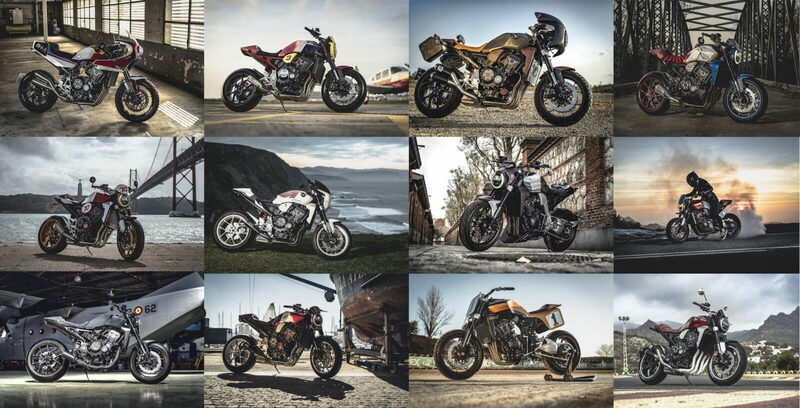 All 13 bikes are listed below, and each has a red button that’ll take you to the relevant voting page for that bike. 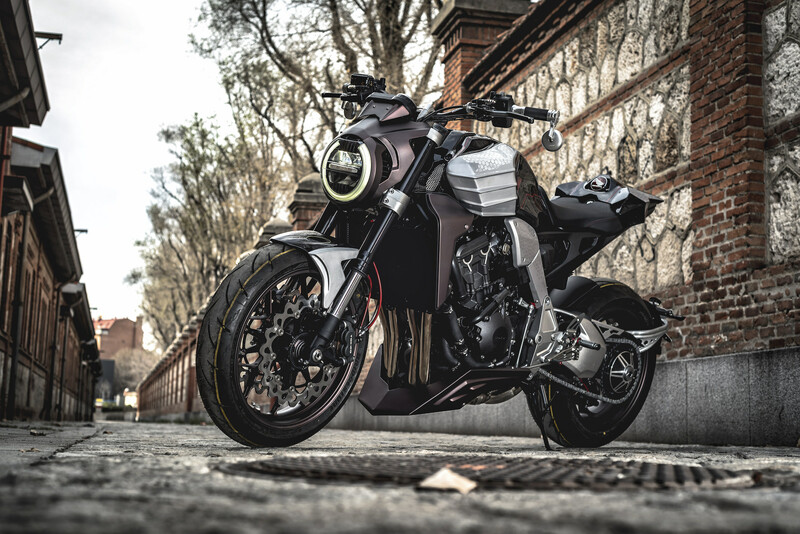 The Honda CB1000R Neo Sports Café is a new-for-2018 model, it’s a significant departure from its predecessors thanks to its retro-futuristic styling. 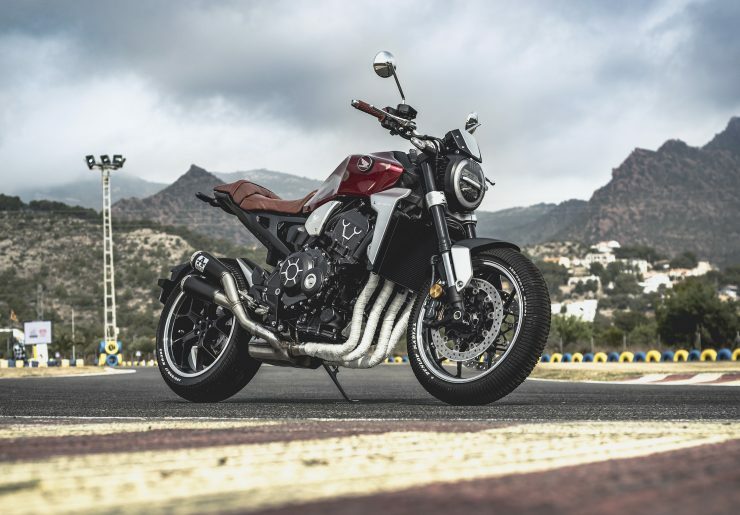 We’re already seeing a number of these on the road, and it’s likely they’re going to sell in significant numbers as many of Honda’s CB models have in the past. 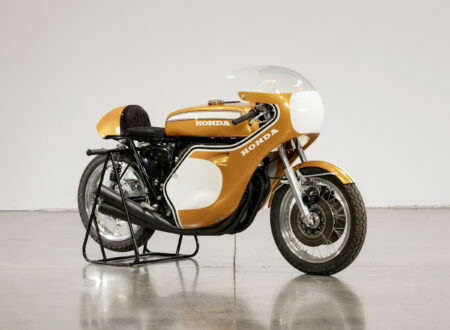 The Honda CB Series has been around since the 1960s, the most famous model was almost certainly the Honda CB750 – the motorcycle for which the word “superbike” was coined. In many respects the CB1000R is the modern day successor to the original CB750, and just like its forebear it’ll be battling the large European and Japanese marques for sales in North America, across Europe, and around the world. 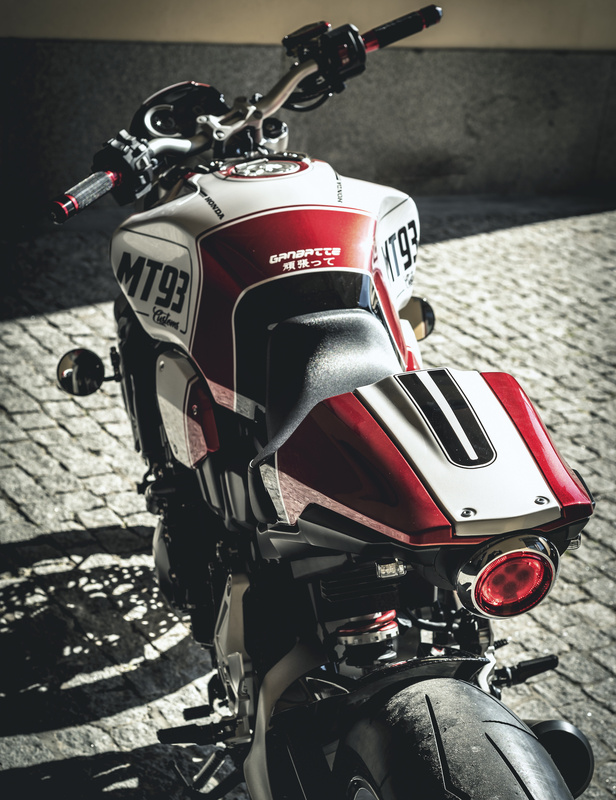 The Honda CB1000R has an inline-four cylinder 998cc engine with double overhead cams, liquid cooling, fuel injection, and a compression ratio of 11.6:1. 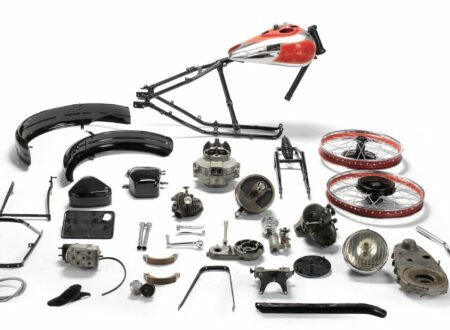 A set of Showa SFF-BP USD forks are fitted upfront, with a Showa BRFC monoshock in the rear, there are twin radial discs on the front and a single disc on the rear, and a steel backbone chassis helps to keep the weight down. 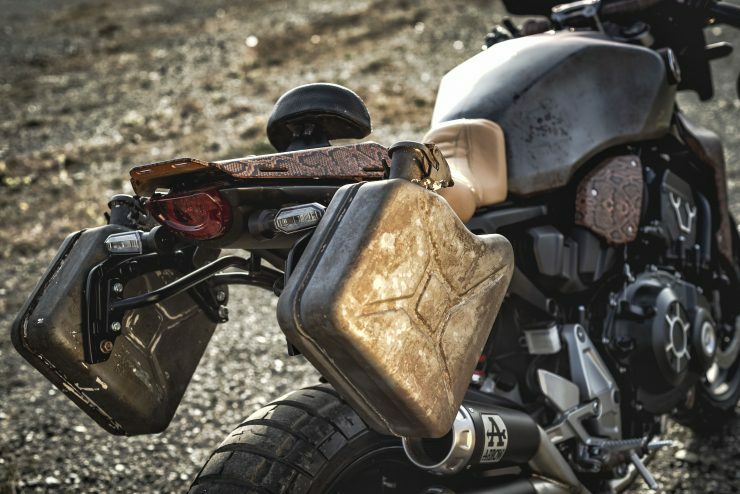 This post-apocalyptic build by ServiHonda in Málaga makes ample use of bare steel and snake skin. 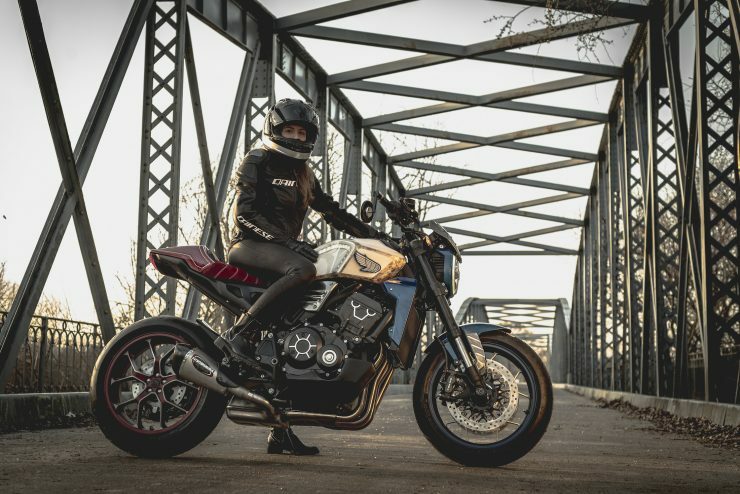 It has chunky dual sport tires front and back, a pair of rear-mounted jerry cans for additional fuel, and a front fairing surrounding a wire mesh protected headlight. This beautiful build from Barcelona takes obvious inspiration from Honda’s iconic endurance racing machines from the 1980s. 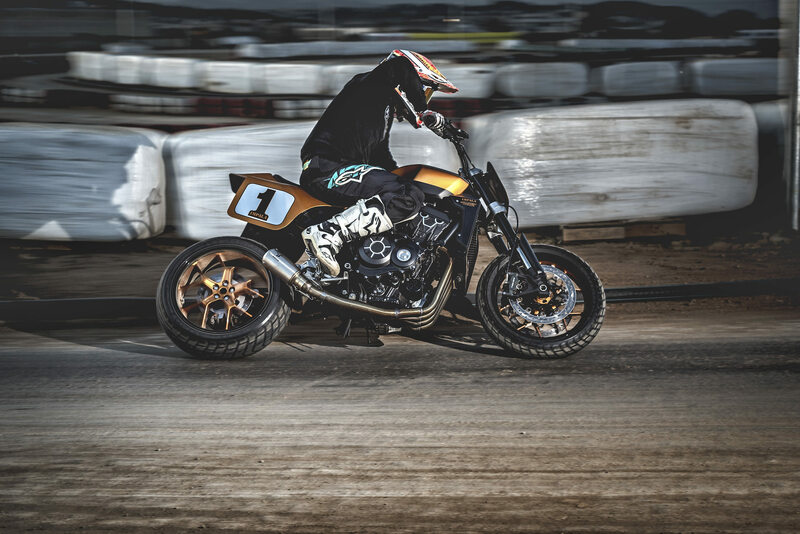 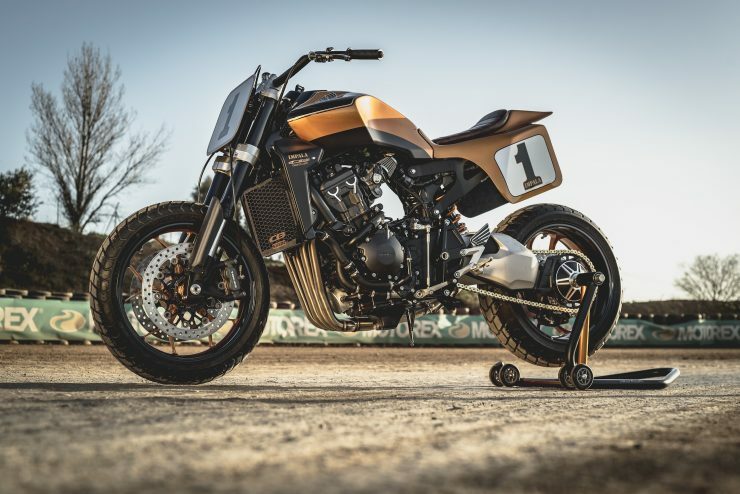 The team at Honda VC Moto Sabadell wanted to incorporate both endurance and dirt track racing elements into their build, an unusual mix we haven’t seen before, though it clearly works very well. This build is a 21st century street tracker with crisp styling and a hefty dose of Blade Runner influence. The bike has dual sport tires, fork guards and an elevated fender up front, with a racing number on the back. 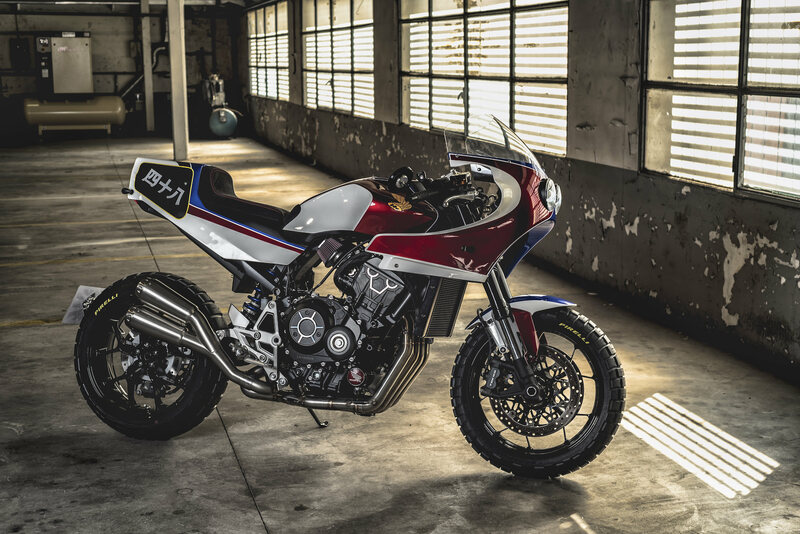 The Honda CB1000R lends itself well to this sort of build and it’ll be interesting to see other similar builds in the future. 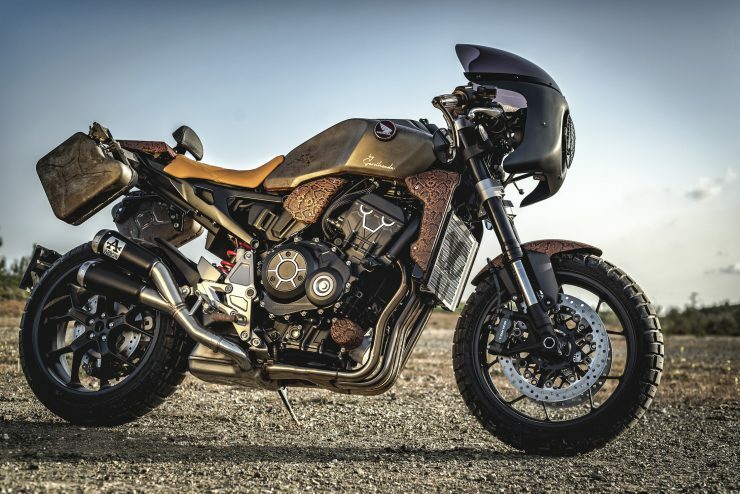 Madrid-based Honda Otobai have taken a different approach with their build, they’ve gone for a futuristic street fighter theme with a dose of classic cafe racer influence and an almost sci-fi color scheme. The stock Honda CB1000R already has a retro-futuristic feel to it, so this custom does a good job of taking it to the next level. 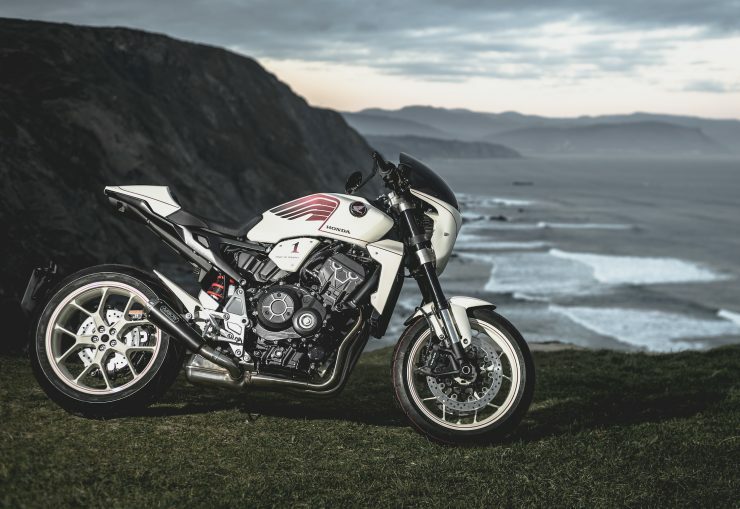 This minimalist build by Portuguese dealer Honda Mototrofa features a number of road-based performance modifications combined with a killer paint scheme. 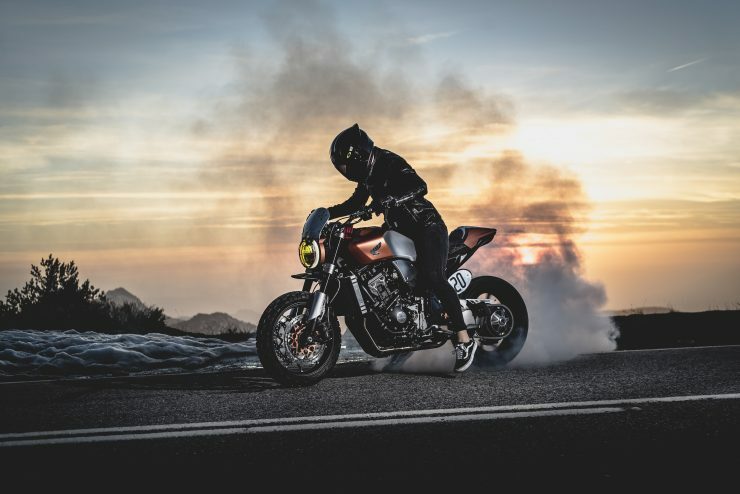 It’s probably the fastest of all the custom Honda CB1000Rs shown here, and I can only imagine how fun it would be on a track day with a fresh set of sticky tires. Bilbao-based Honda Motos Ortasa have gone for a classic Honda CB theme with their build, it features a headlight cowling and a white paint scheme featuring ample use of Honda’s famous wings. 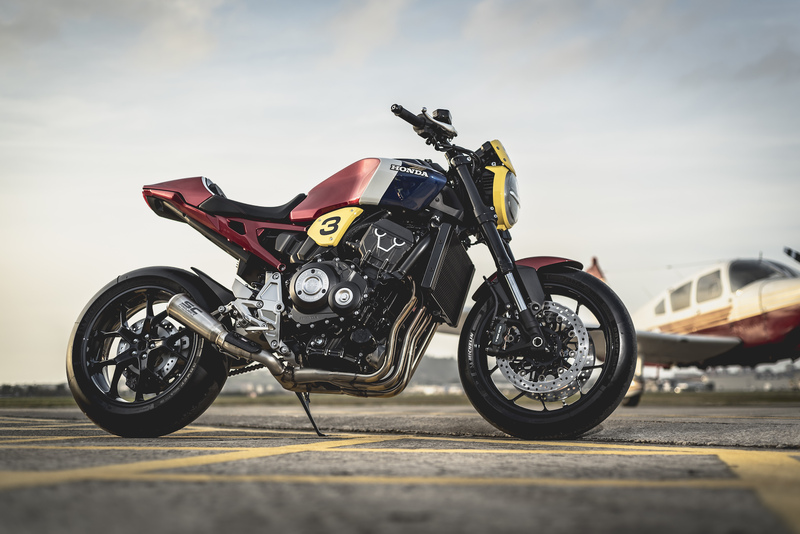 There are a number of subtle touches to this build that pop out as you as you look at it longer, and for many it’ll be a favourite of all the bikes shown here. 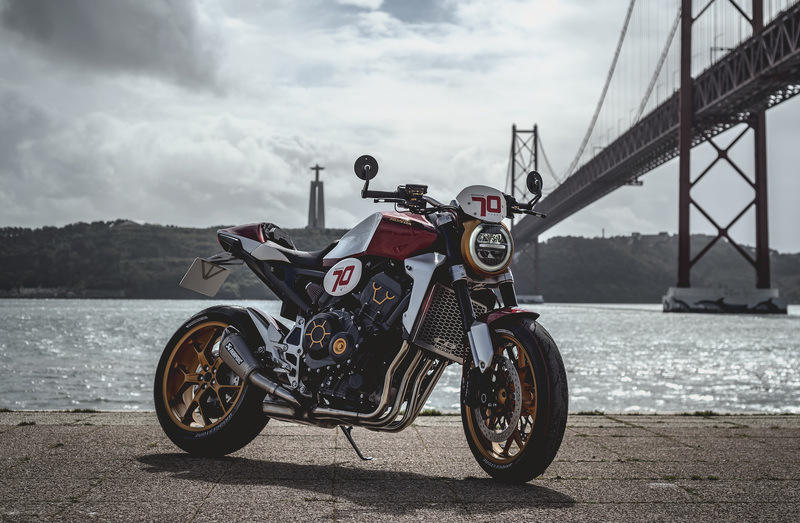 The team at Honda Motorway in Portugal spent their budget largely on performance improvements, to make the bike as quick as possible while keeping the stock suspension and brakes. 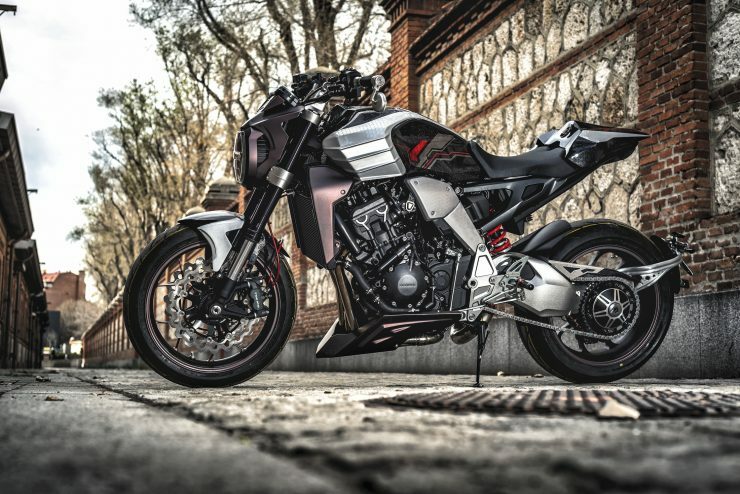 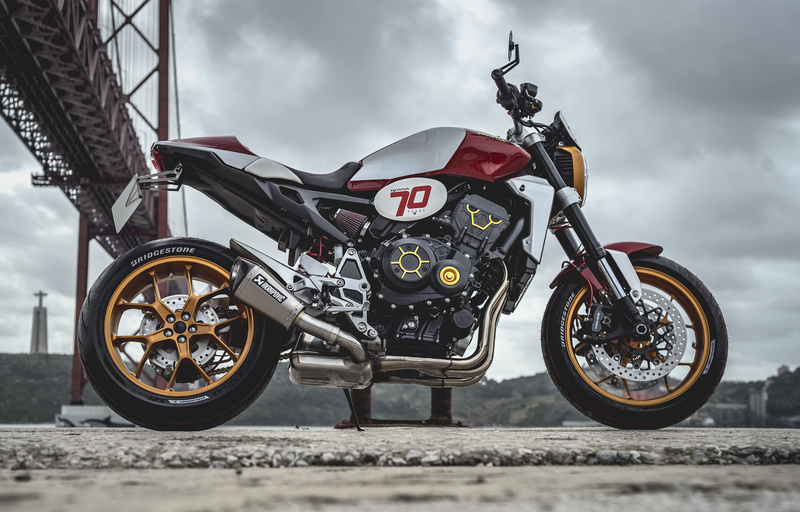 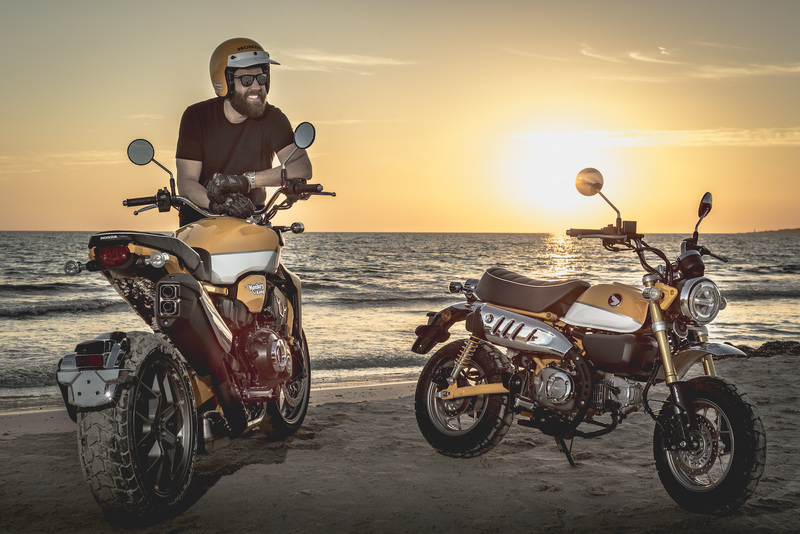 High-flow air filters are paired with an Akrapovic exhaust to get gasses into and out of the engine as efficiently as possible, these are the mods that will likely prove popular with new CB1000R owners. 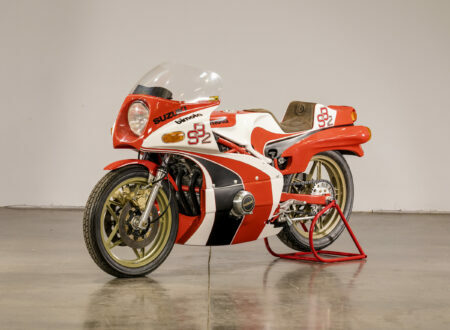 Madrid-based Honda Motor Sport made the most of their 2,000 Euro paint budget, with an ornate red/white/blue paint scheme as a hat tip to Honda’s famous racing colors. 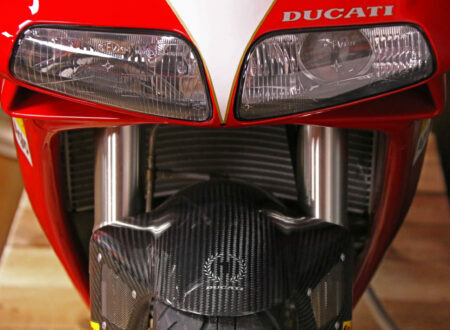 The unusual red ridged seat is paired with a red rear cowl, a red rear wheel, and the red monoshock. 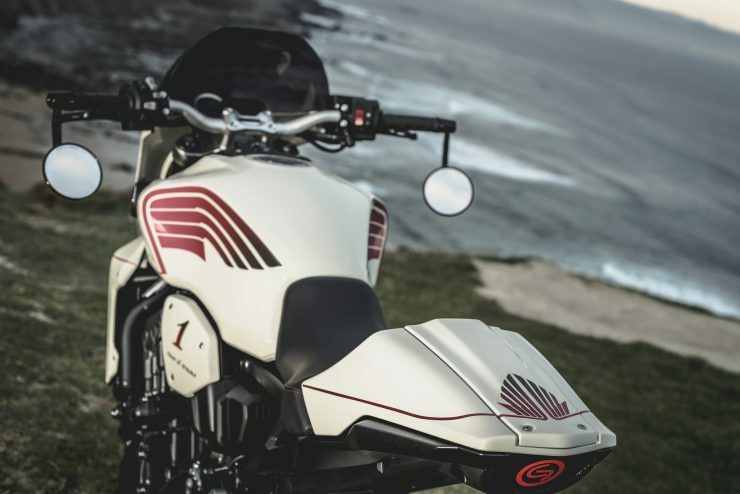 This flows through the white into a blue front end. Honda Motocircuit is based in Castellón, just north of Valencia. 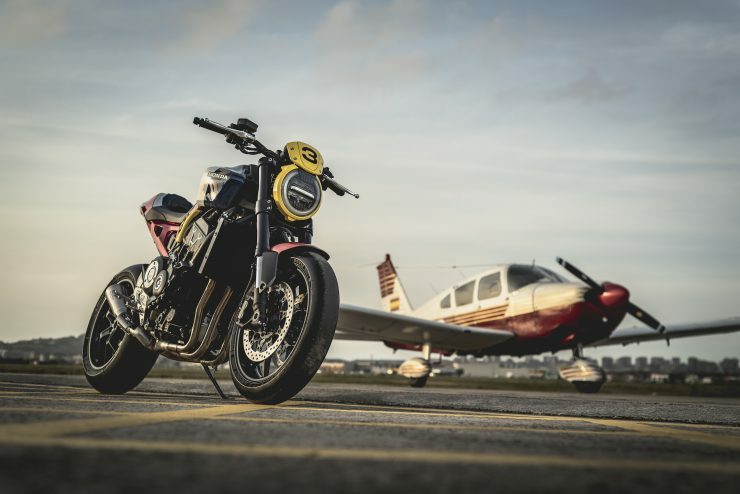 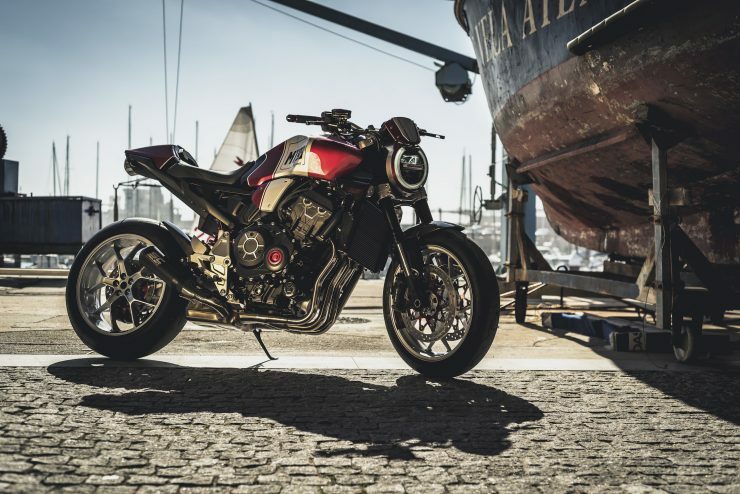 Their custom Honda CB1000R has distressed paintwork on the fuel tank and heat wrap on the headers, making the bike look like a well-worn example with thousands of miles under its belt. 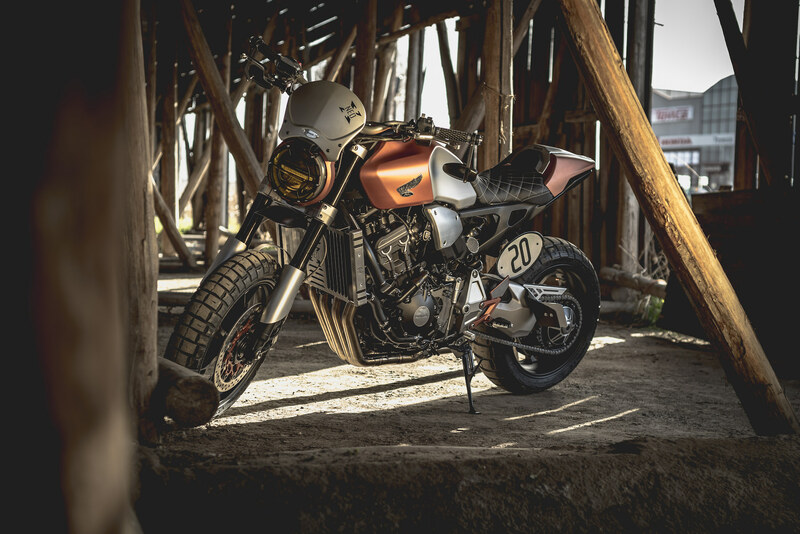 This custom street tracker by Honda Impala is sure to be a crowd favourite, it features a custom subframe with an integrated seat, rear cowling unit, and side number plate. 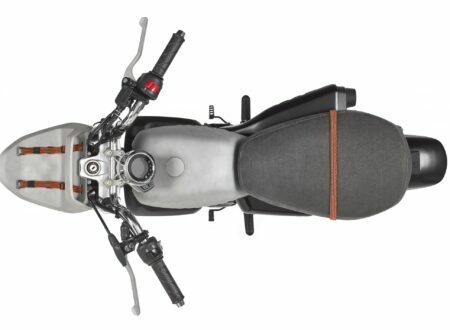 The seat has been carefully integrated into the factory fuel tank, a neat piece of work that took someone a lot of time to get right. 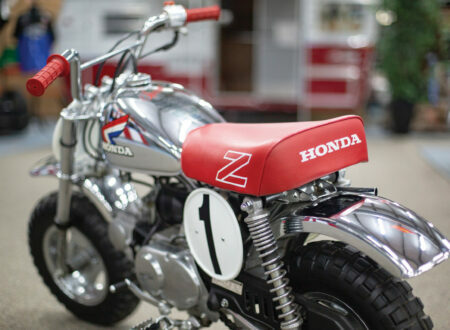 We absolutely love this Honda Monkey-inspired custom from the talented team at Honda Mallorca Motos. 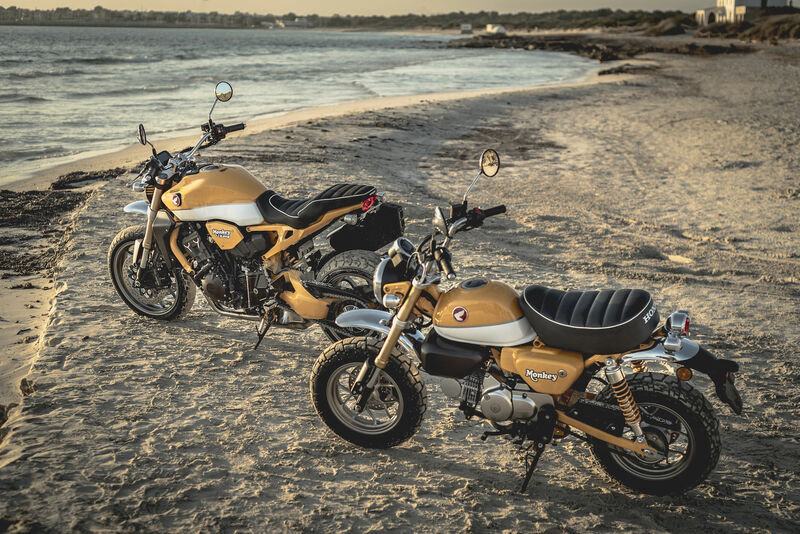 The Honda Z Series of motorcycles became known as “Monkey Bikes” as when you’re on one you look like a monkey from behind – with your knees up and your elbows out. 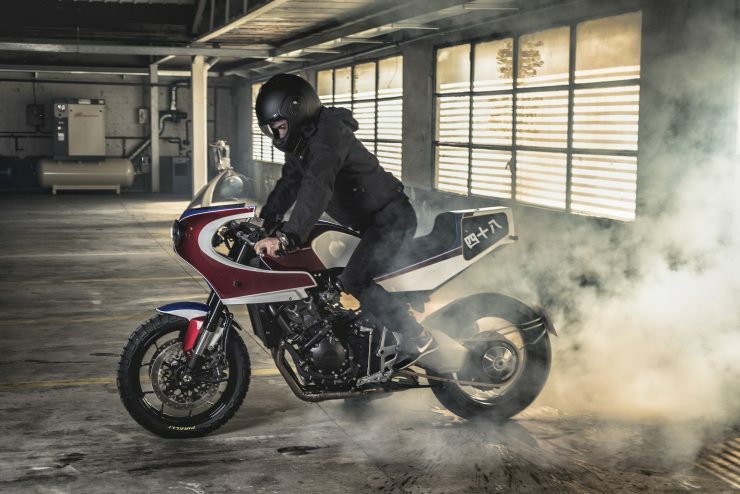 Honda Hakuba Motor have built a stripped back racing-inspired bike using traditional Honda colours and a series of low-key modifications to improve performance. 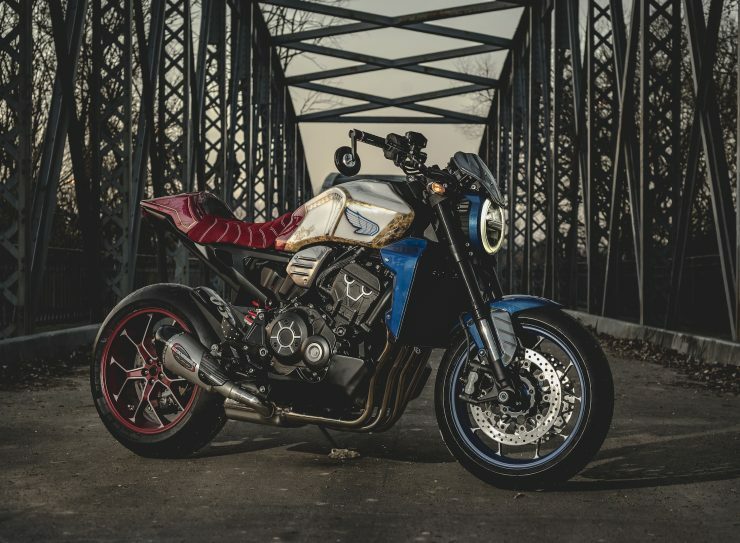 This build has the look of an almost production ready sub-model, and I know a lot of Honda fans would love to see something like this coming direct from the factory. 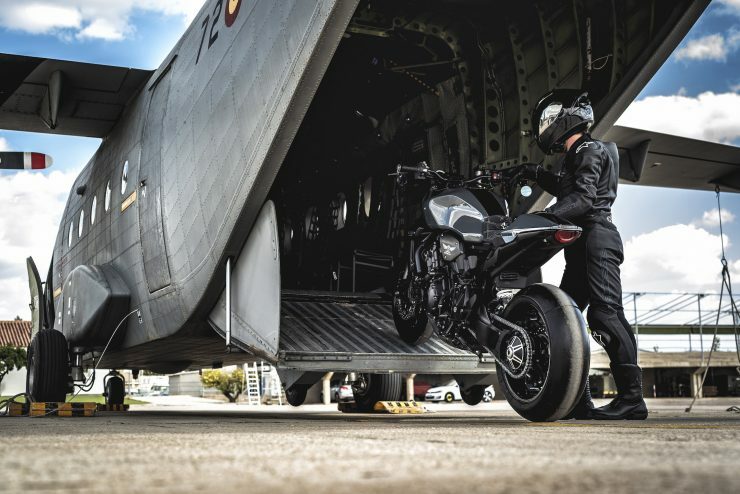 This CB1000R was designed with influence from the Air Force, it’s designed for track use only with a set of full slick racing tires, wrapped headers and a tiny high-performance muffler.